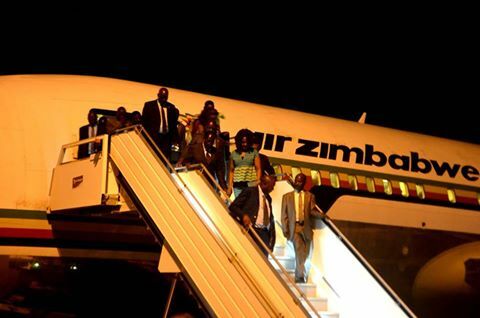 Zimbabwe's President, Robert Mugabe arrived in Papua New Guinea's capital Port Moresby this evening under very tight security, accompanied by over 30 members of his delegation. The President held on to Madam Mugabe hand while he slowly walked down the exit stairs toward an already packed welcoming delegation from Papua New Guinea on ground. President Robert Mugabe will be the only head of state attending the 8th summit of the African, Caribbean and Pacific Group of States (ACP) in Papua New Guinea next week. Fifty delegations from the 79 African, Caribbean and Pacific (ACP) states have confirmed their attendance at eighth leaders’ summit in Port Moresby next week. The 50 heads of delegations include a president, four vice-presidents, 13 prime ministers, one deputy prime minister, one speaker of the national parliament, 14 ministers and 16 ambassadors. Pato said the meeting would be held at the National Convention Centre and chaired by Prime Minister Peter O’Neill. “We may be looking at an attendance of around 500 people, meetings will take place at different venues in Port Moresby, mostly at the convention centre and at the national parliament and Sir John Guise Stadium,” Pato said. “Some of them (ACP leaders) are coming to PNG for the first time.